Aaron McKenna made his transition to six rounds last night with aplomb. The Monaghan welterweight needed less than two stanzas to obliterate Mexican Abel Reyes at the Fantasy Springs Casino in Indio, California. 19-year-old McKenna, following five four-round wins in nine months, was handed his first step-up in distance on the Golden Boy on ESPN bill and flattened his opponent with body shots. Reyes was down in the opener by a left hook and, while he beat the camp and saw the bell, he was put away with the same shot in the second. It was another impressive win for ‘The Silencer’ who also had a high-profile fan in attendance. 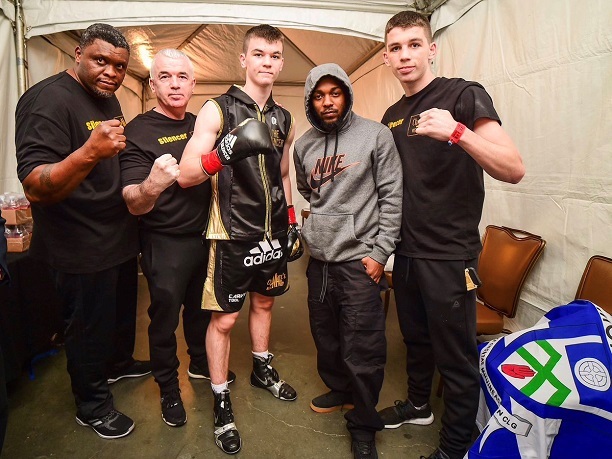 After meeting him in the gym last week, hip hop star Kendrick Lamar stayed true to his word and came to the fight night solely to support McKenna. The Smithborough fighter moves to 6(4)-0 following the win while Reyes drops to 4(4)-2(2). McKenna, who recently signed a sponsorship deal with Adidas, will no doubt be keen to be out again as soon as possible but it may be 2019 before he gets the chance to add to his record. The L.A.-based teen is targeting titles in the new year and believes that further step-ups in rounds will only suit him more.